Oh good! A book that combines a bottom joke and an ‘eat your greens’ message will be a winner with kids and parents alike. 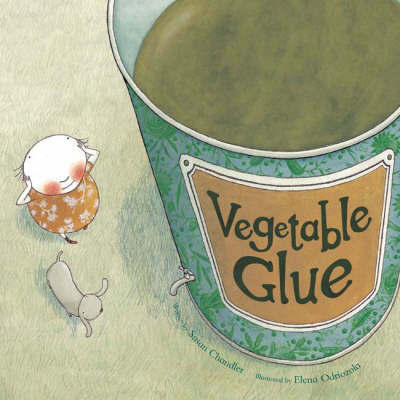 Vegetable Glue, written by Susan Chandler and cleverly illustrated by Elena Odriozola, is a funny, rhyming story about why it is important to eat your vegetables. As Chandler tells it, people must eat their vegetables or ‘bits’ fall off your body. Read this story to your children and if they are like mine, their response will yo-yo between alarmed – “When my right arm fell off, I knew what to do,” to hilarity – “I stuck it back on, With vegetable glue.”. The little girl narrating the story tells us of the problems she encountered when she would only eat cake – she kept losing bits from her head to her toes – “While others are playing, I can’t even cough. If I sneeze or I burp, Then something falls off.”. Watch your kids split their sides when her bottom drops off. The rhyme is funny and never contrived (there is nothing worse than a rhyming story that forces words, simply to rhyme) and accompanied by Odriozola’s stunning illustrations, is a brilliant choice for pre-schoolers. The added bonus is the ‘eat your vegetables’ message, delivered in a subliminal way – kids will be focused on the ‘glue’ and the ‘bits falling off’ before realising that the production of vegetable glue involves eating peas! Vegetable Glue is available from The Book Depository for $10.05. Book Depository delivers free of charge to Australia. If you are looking for other books about eating vegetables, check our previous posts here.